Is the iPhone Flash Useful Outdoors? One of the most popular tricks used by event photographers is to turn on the flash for outdoor portraits. I've used this successfully with DSLRs and compacts. But do you get the same magical benefit from the LED "flash" on the iPhone 5S? Kathleen and I decided to test this during an assignment photo shoot today. First, I posed her against a bright background and turned on the iPhone flash. As you can see, she was wildly underexposed. With any of my standard cameras, this image would have turned out great. Then I changed directions and used a shaded area as the background. I wanted to see if the LED could provide any benefit in this type of lighting. We shot with the fill flash on (left), and with the flash turned off (right). At first I didn't think the flash was making much difference. But later, when I had a chance to compare the images on my Mac, I could see some of the benefits of the LEDs. The skin tones were warmer, eyes brighter, and overall, more glow. Bottom line is this: with bright, contrasty backgrounds, your iPhone fill flash is like a pea shooter at a bazooka range. But when both subject and background are in open shade, it's worth turning on. Give it a try. Tidy Up Your Aperture Library Using "Merge Projects"
Over the course of the year, our photo libraries tend to become a bit disheveled. As I prepare for 2014, I like to have my 2013 images in shape. One technique that I use regularly is "Merge Projects" that allows me to combine multiple projects into one. Using the Merge Projects command in Aperture. For example, I realized that I had created and backed up multiple projects for my trip to Oahu this summer. In part this was because I had shot with three different cameras. I was able to combine them easily by selecting the two projects in the Library tab of the Inspector (by holding down the CMD key), then going to File > Merge Projects. Aperture presented me with this confirmation message. Once I click on the Merge button, Aperture moves the images, albums, and any other parts I've created over to the other project. Typically, the application will move the lower project into the one that's positioned higher in the library. But I don't worry about it either way. Once I'm finished merging, I can rename the project by tapping on its name and typing. Keep in mind that you can use Folders to organize your projects (File>New>Folder). Just drag the Projects into the new Folder, give it a name, and position it where you want it. Those of us who are trapped inside by cold weather can put that confinement to good use by getting our photo libraries in order. 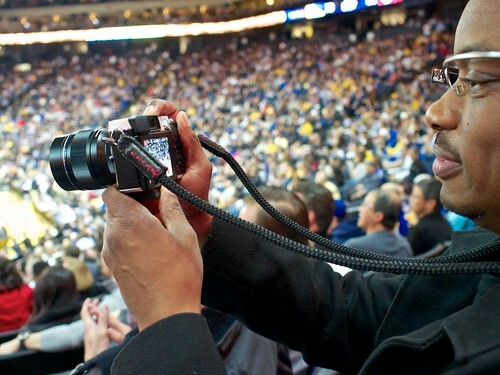 I met Frederick Van Johnson at the Warriors game last night at Oracle Arena, each of us armed with our nimble photographer kits. Frederick was sporting Google Glass and a Panasonic GX7. I had the OM-D E-M5. We swapped lenses back and forth using the Olympus 75mm f/1.8 and the Olympus 17mm f/1.8. I captured this image of Frederick working with the 75mm on his GX7. Since I was toting the innocent looking Walking Man Shoulder Bag, I had no problem getting through security with my gear. Frederick, on the other hand, was traveling with his thinkTANK Photo SubUrban Disguise 30, and attracted the attention of the inspectors. He was delayed about 15 minutes entering the arena, but we finally met up in the Club right before tipoff. I enjoyed swapping lenses and trying out the GX7. It's a fun camera that feels solid and sports a handsome design. Frederick had a chance to try out the Olympus 75mm prime on the GX7. It looked like a match made in heaven. He loved it, and I suspect he'll be purchasing one in the future. You can see for yourself how wonderfully sharp and fast this lens is (photo above). We were taking pictures from Row 16, and had no problem capturing the action. Hopefully, I'll be able to post a movie soon that Frederick recorded with his Google Glass. Stay tuned. It's the little camera that keeps on getting... high praise, that is. The Panasonic LUMIX DMC-GM1 scored very well in the recent PhotographyBlog review where Gavin Stoker wrote, "In a nutshell, if you loved what you saw of the output of the GX7 but felt the body would be better even smaller, then the Panasonic Lumix DMC-GM1 could be well worth giving a proverbial spin." This followed DP Review's Allison Johnson citing that the GM1 is her personal favorite of mirrorless cameras this year. She wrote, "It struck a chord with me particularly, since it seemed to be a weird mashup of each of the cameras I'd previously reviewed for DPR. If you took the concepts behind the Pentax Q7, Sony RX100 II and Olympus E-PM2 and threw them in a blender, the GM1 might be the thing that comes out." Reviewers cite that it's very well made and produces great images, justifying the price tag. So this is one to keep an eye on. If we start to see discounts on the GM1, you might want to revisit this gem of a mirrorless camera.